Beyond a basic colour scheme change, the next makeover level involves replacing cabinet hardware. Remove a set of hinges, knobs and/or pulls to identify the type of screw/bolt settings that will be needed. Then, choose from the many options available at home building centres or specialty knob stores. Similarly, consider a new faucet and sink, upgraded countertop or a fresh tile backsplash. Each will contribute to a dramatic change. You may want to consider replacing or refinishing the drawer and cupboard facings as well, although that would likely require professional help. 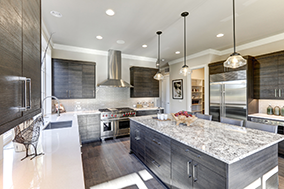 Improved lighting is another important way to change a kitchen’s look and functionality. However, general overhead lighting, strategic task lighting and ambient mood lighting could involve rewiring. Finally, replacing the flooring will result in a significant change to any kitchen. Choices range from recycled cork to indestructible granite. Remember to consider not only appearance but also practicality.